Our Circle of Friends of FPMT Has Expanded – Thank You! 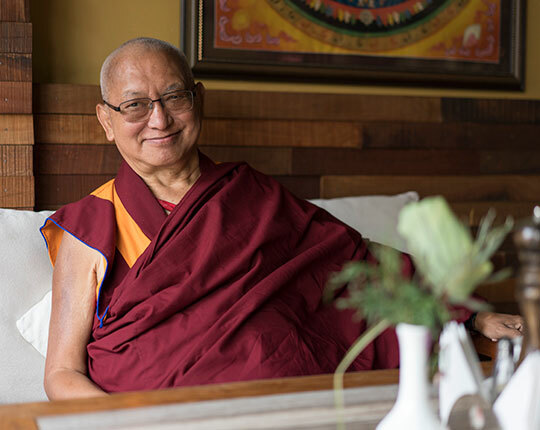 In case you missed it earlier, please listen to Lama Zopa Rinpoche’s thanks for all your recitations for his health and long life! Please join us in rejoicing in the numbers of accumulated recitations! Lama Zopa Rinpoche and Khadro-la blessing people with a Dharma text, Bhutan, May 2016. Photo by Ven. Lobsang Sherab. 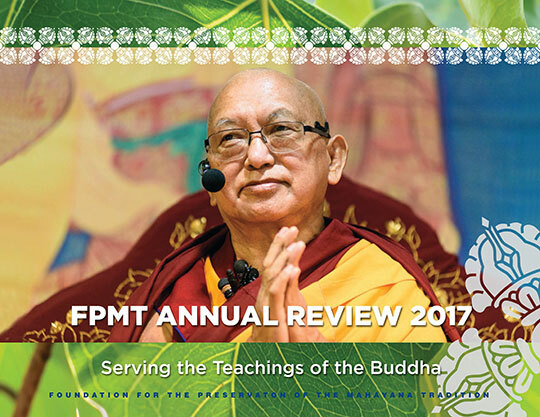 Welcome to the FPMT Annual Review 2017: Serving the Teachings of the Buddha, which shares the story of our 2017. Included is Lama Zopa Rinpoche’s essential letter, together with an overview from our CEO Ven. Roger Kunsang, plus beautiful photos and reports on our work in education, charitable projects, communications, and more. Please rejoice with us that during Losar and the Fifteen Days of Miracles, more than US$15,000 was offered from the FPMT Puja Fund to over 16,000 Sangha in monasteries and nunneries around the world, including IMI Sangha communities. Offerings were made to all of Lama Zopa Rinpoche’s gurus; gold was offered to holy objects in Tibet; robes were offered to the statue of Buddha in Bodhgaya, India; paint, saffron petals, and umbrellas were offered to two holy stupas in Nepal; as well as a vast array of pujas were completed, including the recitation of the Prajnaparamita. These practices are always offered on behalf of all beings; every FPMT center, project, and service; and all donors to the FPMT Puja Fund. We are so happy to be able to make these offering and thereby make this ultimate investment in the organization every merit multiplying day. This is an incredible opportunity to join in and be part of these ongoing offerings and beneficial activities. Dear Merit Box practitioners, collection season is almost over! These are the last few days to submit your Merit Box offerings to be counted toward 2018 grants for Dharma projects and initiatives around the world. Deadline is March 31. See how to submit your offerings and rejoice in having created so much merit! 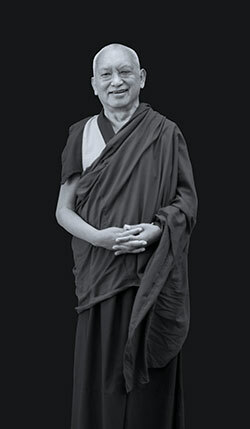 Lama Zopa Rinpoche has said very strongly on many occasions that The Method to Transform a Suffering Life into Happiness (Including Enlightenment) with Additional Practices is a practice that he would like all his students to do every day. Find out more about the updated edition. 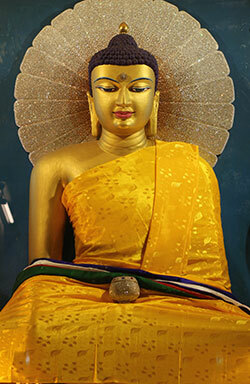 A Daily Meditation on Shakyamuni Buddha eBook and PDF, recently updated by Lama Zopa Rinpoche, this practice for beginning students contains mantra recitation and visualization based on Shakyamuni Buddha, and a lamrim prayer to request blessings to develop all the realizations on the path to full awakening. A Short Practice of Green Tara is now available in ebook format! Over the recent two weeks of auspicious Days of Miracles, we thanked over 130 Friends of FPMT, new and old, who contributed to our efforts in increasing access to the Dharma around the world by joining or re-joining our program. Please take a moment to rejoice in all this compassionate generosity! Learn more about Friends of FPMT. We say farewell to Andrew Shaw and welcome Nicole Parisi-Smith as Mandala assistant editor. 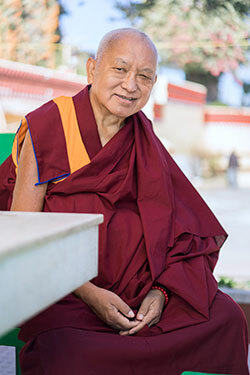 Lama Zopa Rinpoche, November 2017. Photo by Ven. Lobsang Sherab. 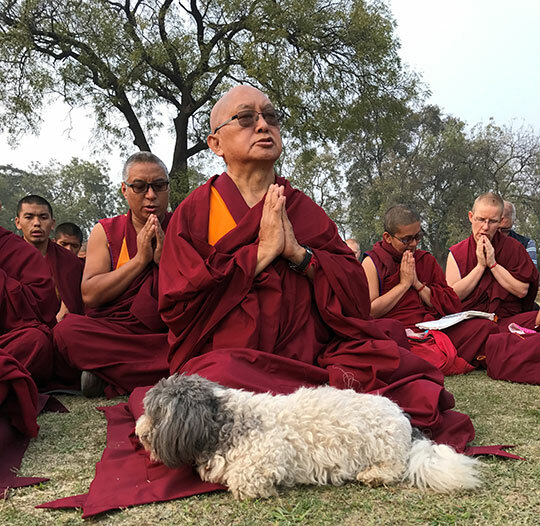 We’re delighted to let you know that there are new high-resolution photos of Lama Zopa Rinpoche for your center, project, or service to use in the “High-Resolution Photos of Our Lamas” section. Find this in the “Resources at a Glance” section of the Affiliates Area, which lists many useful resources for you. International Mahayana Institute (IMI) has sent a report on its activities during 2017. 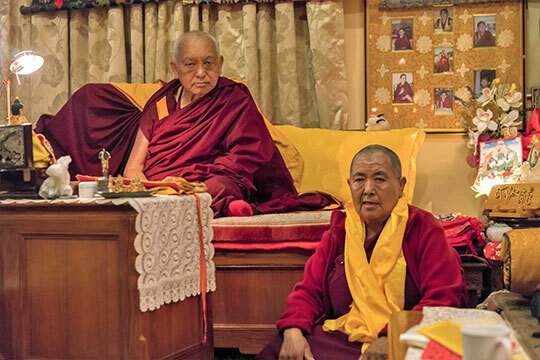 Find information about and rejoice in how your donations to the Lama Yeshe Sangha Fund (one of the mandated annual donations to be made by FPMT centers, projects, and services) are being used to benefit monks, nuns, and the organization as a whole. Find the 2018 report here. 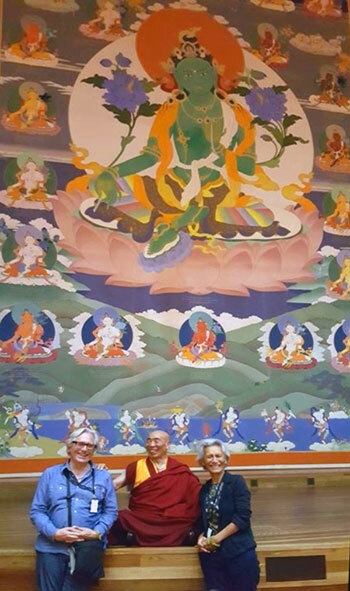 After blessing the thangka, Tara Institute’s resident teacher, Geshe Doga, laughs with artist Peter Iseli and his wife Jangchub. Photo by Lynn Miller-Coleman. Education Universelle France (EUF) is organizing the first international 16G Retreat-Gathering. It is open to anyone who has completed a 16G Level 1 workshop. This is an opportunity to share experiences, build the 16G and UE community, and gain inspiration from what is going on in different parts of the world. Facilitators from Argentina, Canada, Italy, the UK, Spain, and France will lead workshops and share their knowledge and ideas. Le Service de traduction de la FPMT est heureux de vous présenter ses premiers livres audio : “Premiers pas dans la méditation” (12 méditations guidées) et “La méthode qui change une vie de souffrance en bonheur”. Des extraits de ces livres audio sont proposés sur YouTube. Se procurer ces livres audio. Isabel Arocena—long-time FPMT student who offered service in many different ways, including as director of Lotsawa Rinchen Zangpo Translator Program, Spanish national coordinator, and more—passed away last month. She will be missed by her FPMT family. Would you like to spend your days in a very meaningful way? Have a look at the regularly updated meritorious opportunities to offer service as a volunteer or as paid staff in FPMT centers, projects, and services around the world. Newly added: Lawudo Retreat Center, Nepal, is looking for volunteers; Kalachakra Center, France needs a vegetarian cook for its retreat facility; the French Translation Service is looking for more translators and other assistance; and Mahamudra Center, New Zealand, has a vacancy for a co-center manager.